Company: Times Centre for Learning Ltd. It is estimated that in the next four years, the banking, financial services and insurance (BFSI) sector will create 9 lakh jobs in India. This job creation may be directly attributed to the technological advancements and digitisation in the sector that have forced many to gain new skills. TimesPro, with its state-of-the-art-infrastructure and a consistent placement record, is working towards imparting these new skills to the youngsters in the country year after year with its specialised MBA in Banking and Financial Services. With 65% of the program focused on industry exposure and practical knowledge, the course's unique structure enables students to be 100% industry ready even before they have graduated. They say numbers tell the holistic story. It couldn't ring truer in case of TPL's MBA program placements. In the last four years, the average salary of an MBA professional from TimesPro has grown 17% year on year. From 3.08 L for the 2014-16 batch, it increased to 3.6 L for the 2015-17 batch. Post that, it jumped to 4.2 L for the next batch and is expected to only to grow-upward. The educational institute has successfully managed to keep its placement record upwards of 90% starting from 2014 until now. Speaking about the placements, Parikshit Markanday, Vice President, TPL said, "TimesPro has always attempted to address the gap between education and industry employability. With the help of our uniquely designed MBA, multitude of our students have bagged enviable jobs with their favourite brands and are happy to start their career under the guidance of some excellent faculty members at TPL. Year after year, our students are placed among the top BFSI companies who keep coming back to us given their experience with the previous batches." With top MNCs, private sector banks and NBFCs as placement partners, MBA graduates from TPL boast of some top of the market brands such as DBS Bank, HSBC, Citibank, Deloitte, EY, Kotak Mahindra Bank, IndiaBulls, PayTM, Axis Bank, and many others. The available job-portfolio is diverse depending upon prior experience. The junior-most role being that of a Research Associate, companies are offering TPL's MBA graduates managerial and analyst roles in plenty. For the current batch, the highest salary bracket is bagged by 34% students. Given the demand for professionals in the industry, BFSI sector has been the biggest recruiter in the market and for the program at TimesPro. Rachita Garg, an MBA in BFSI student from TimesPro, placed at ICICI Prudential Mutual Fund, has to say all good things about the experience. She says, "While I was going through the enrolment process, I saw everything the program had to offer - from on-the-job-training to Harvard Business Case Studies. During the program, I realised it is a perfect mix of campus life and corporate world. Today, I feel like I have successfully completed a challenge and the reward is my placement with one of the top brands in the country." Parikshit added, "With our placement record at an all-time high, we hope to continue remaining the choice of partner for both the learners as well as our placement partners." At TimesPro, the MBA curriculum is designed by experts from around the industry and specific sectors. The course structure is not just theory focused, but helps student gain direct practical exposure and industry knowledge through workshops and field visits that later helps them with getting their desired job role during placements. At TimesPro, the team believes that the best way to educate is not books but experience! To know more visit - https://timespro.com/mba/ or call - 18001022323 About TimesPro TimesPro under the brand Times Professional Learning is a division of The Times of India group offering a variety of courses in banking, digital marketing, data science, SAP, business analytics that allows a student to kick start his or her professional career. Our vision is to ensure that we provide the Indian youth with tailor made and industry vetted educational courses that bridge the gap between the current formal education system and what the Industry requirements are, thereby making our Indian youth employable. Coimbatore, 08.09.2018: Revelling in the success of placing 75% of students in the top leading banks and MNC's of the country with an attractive package, TimesPro Coimbatore organized an event to facilitate the students with a token of appreciation. The ceremony was graced by Mr. N. Krishnamurthy, Director, Corporate Relations at Hindusthan Educational Institutions, as the honourable chief guest of the evening. The students were conferred with accolades by the distinguished chief guest. He said, "It has been a pleasure awarding these righteous candidates of TimesPro, who are on their way to implement an innovative approach to bring about the required transformation. TimesPro is doing a commendable job of inculcating and enhancing skill-set in the candidates to make them an abled and technically adept professionals." TimesPro Coimbatore provided 100% placement assistance to all its students. The top companies which recruited from the centre include leading banks, MNCs and financial institutions like Axis Bank, IndusInd Bank, Citi Union Bank and CSB. The highest CTC offered to a candidate was INR. 4, 50,000 lakh per annun while at average candidates got 2.6 lac per annum emolument. Gunajerre a TimesPro student, who landed the position of Relationship Manager in Bajaj Capital said, "TimesPro helped to build and enhance my technical skills. I cannot be grateful enough to the faculties of TimesPro for helping me broaden my horizon, and motivating me to think out of the box." Sumathi, who got placed in Kotak Life insurance as Asst.Manager- Branch Operation, excited about embarking upon this new opportunity provided by TimesPro said, " Every session and every hour spent at the TimesPro Coimbatore Centre was intellectually invigorating. I highly recommend TimesPro to every working professional who wishes to escalate their career graph." Dr. Nagendra Chowdary, Head of Academics and Vice President of Times Professional Learning said "TimesPro strives to come up with an innovative educational approach to help candidates achieve their worthy career goals with adequate skill-set on industry norm and standards. We aim to bridge the gap between education and industry requirement by transforming candidates into abled professionals. To know more about the PGDBM program visit www.timespro.com About TimesPro: TimesPro is an educational division of Times Professional Learning, offering premium courses in the field of banking, business analytics and finance. With the aim to enhance nation's employability scale by imparting industry fit education to graduates to help them become an able professional. Recently it has been awarded the prestigious Best B2C Edtch Company of the year at The EdTechReview Awa Ceremony 2018, held on the 3rd of February, 2018 in New Delhi for its technology-enabled delivery for multiple courses across multiple centres. Mumbai, August 29, 2018: TimesPro has been awarded Bronze at the Brandon Hall's HCM Excellence Awards 2018 in two categories Best Advance in Learning Measurement - SEQ, and Best Certification Program - PGDBM 2.0. 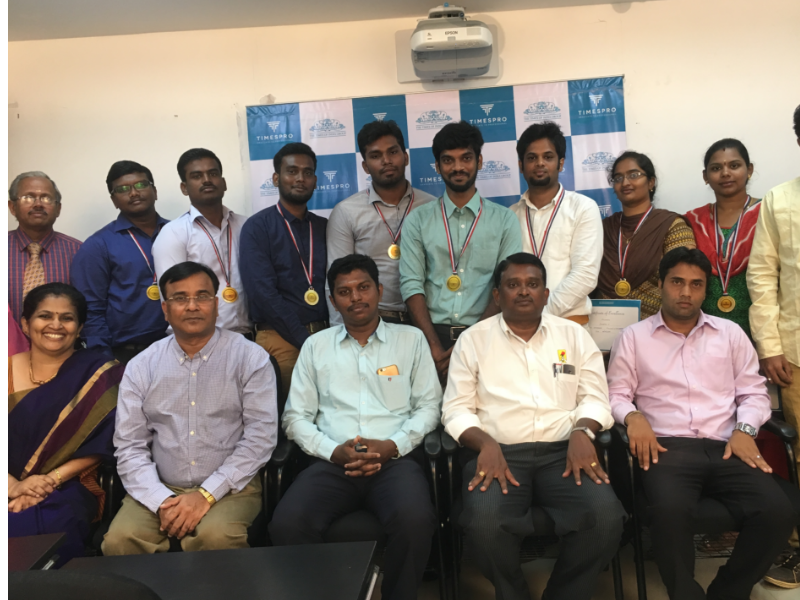 Speaking on the occasion, Dr. Nagendra V Chowdary, Head - Academics, said, "We are honored to receive these two awards which we see as recognition of TimesPro's continued efforts to make a difference to our outcome-based training. While SEQ is a unique tool developed to monitor and measure our training efficacy, PGDBM 2.0 has been a thoroughbred outcome-based curriculum. Today, TimesPro boasts of an enviable track record of advancement & innovation in the learning space with content, delivery and placements. By August 2018, TimesPro has touched lives of around 5000 students" The Brandon Hall Awards was a closely contested event with some of the most globally renowned companies such as Deloitte, McKinsey, Walmart, EY, Accenture, Capgemini, TCS, Mahindra & Co., NIIT, Shell, Bank of America, and Dell EMC Education Services, competing for and winning the top spots. The judging process was rigorous. The entries were evaluated by an international panel of independent industry experts, Brandon Hall Group Senior Analysts and Brandon Hall Group Executive Leadership Team. The judging criteria were 'Fit the Need', 'Design of the Program', 'Functionality', 'Innovation' and 'Overall Measurable Benefits'. TimesPro won hands down, proudly getting home two Bronze Medals. "Excellence Award winners personify innovation that drives business results. Our winners embrace the future and embrace change and the challenges that go with it," said Rachel Cooke, Chief Operating Officer of Brandon Hall Group and head of the awards program. "It is amazing in reviewing these entries how organizations - both large and small - work across functions to make human capital management a valuable asset that enables business success." The winners are listed at http://www.brandonhall.com/excellenceawards/past-winners.php About TimesPro: TimesPro is a part of Times of India Group's Times Professional Learning (TPL). Established in early 2013, it offers a variety of courses in sectors such as banking, analytics, digital marketing, data science, SAP and many customized programs. As a professional skilling powerhouse for graduates and working professionals, TIMESPRO equips students with key skills that allows a student to kick start his or her professional career. TIMESPRO's vision is to convert demographic potential into demographic dividend by making Indian youth employable with right skill set. To know more visit www.timespro.com About Brandon Hall Group Brandon Hall Group is a HCM research and advisory services firm that provides insights around key performance areas, including Learning and Development, Talent Management, Leadership Development, Talent Acquisition, and HR/Workforce Management. With more than 10,000 clients globally and 20 years of delivering world-class research and advisory services, Brandon Hall Group is focused on developing research that drives performance in emerging and large organizations, and provides strategic insights for executives and practitioners responsible for growth and business results. Patna, 11th August 2018: To rejoice in the celebration of the record of successfully placing 95% of students for the last 6 years, TimesPro held a felicitation ceremony on August 11th. The commemoration was graced by the Vice-Chancellor of Patna University, Mr. Ras Bihari Prasad Singh as its distinguished chief guest who felicitated the meritorious students who have secured dignified positions in top-tier banks and NBFCs. The event which was held at Patliputra Exotica, Patna, saw the alumni sharing their experience on how TimesPro prepared them to face the challenges on the global corporate ground. Among several gratitude stories, one of them is Lalan's. He is a Carpenter's son, hailing from a humble background in Patna. With TimesPro, he was able to nurture and fulfill his dream of becoming a banker. The chief guest for the evening, Former VC of Patna University and Former HOD of Geography, Dr. L. N. Ram had a few words to say on this momentous occasion. He said, "The vision with which TimesPro is striving to help aspirants to stand tall and compliant with the industry requirement definitely reassures my faith that the education system is heading towards progress. Today's banker should also keep the humanitarian aspect in his mind while doing his job. Customers need to be treated with respect." Speaking at the event, Vice-Chancellor of Patna University, Mr. Ras Bihari Prasad Singh said "TimesPro is helping all stakeholders of the education industry to develop and adapt to the changing industry demands. Bihar and Jharkhand has been facing an unemployment issue. The major reason is the gap between the knowledge acquired through education and jobs available in the Industry. Hence he encouraged the students to take assistance from institute like TimesPro and horn their professional skills" Mr Rajiv Ranjan, Zonal Sales Head at IndusInd Bank, talking about the skill and education battle said "Students should not be made to master the old ways to solve the contemporary issues. They need ample exposure, which TimesPro makes sure is provided to all its students. I can proudly say that hiring graduates from TimesPro would add unprecedented value to our organization. There is an urgent need for learning centers like TimesPro in Patna to improve the employability situation and fill the potholes of lack of skills amongst youngsters." Mr Ajit Kumar, Asst. Vice President of Kotak Securities emphasizing on quality education said: "Learning centers like TimesPro are polishing student's overall approach by imparting industry-centric education, making them capable of tackling global challenges head-on. I am pleased to be a part of such a gathering where young minds shine bright." Mr Anil Tripathi, Business head - Corporate Training, Times Professional Learning said "TimesPro has been able to impact more than 30,000 students with its trainings and placement. We are focused on addressing the gap between education and industry employability by creating a pool of talent. We are simply following our vision of fulfilling learning aspirations of millions across geographies by making excellence accessible through these global collaborations" To know more about the PGDBM program call 9570779745 or visit www.timespro.com About TimesPro: TimesPro is an educational division of Times Professional Learning, offering premium courses in the field of banking, business analytics and finance. With the aim to enhance nation's employability scale by imparting industry fit education to graduates to help them become an able professional. Recently it has been awarded the prestigious Best B2C Edtch Company of the year at The EdTechReview Awa Ceremony 2018, held on the 3rd of February, 2018 in New Delhi for its technology-enabled delivery for multiple courses across multiple centres.